Islavale Irish sold for 16,000gn. 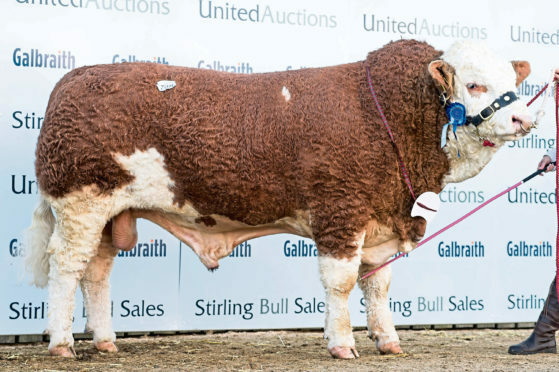 Simmentals met a steady trade at the Stirling Bull Sales, with 69 selling to average £6,187 – up £467 on last year – and eight making five figures. Leading the sale at 16,000gn was an entry from the Stronach family’s Islavale herd at Berryleys Farm, Grange, Keith. March-2017 born Islavale Irish, by Curaheen Bandit, was part of the champion pair at the Scottish National Show. He sold to Backmuir Livestock, Keith. The next best price of 14,000gn was paid twice. First at this price was Rockytop Invader, by Kilbride Farm Fearless, from Gary and Angela Christie, Birchfield, Glass, Huntly. He sold to Cameron MacIver, Wester Coltfield, Forres. The other, selling to Noel Kilpatrick, Co Down, was Saltire Impressive, by Woodhall Ferrari, from the Houlistons, North Berwick. Thereafter, 13,000gn was paid for the reserve overall champion from the MacPhersons at Blackford Farm, Croy. Blackford Iolair, by Kilbride Farm Doubleaction, was beef breeder champion at the Highland and champion of champions at Nairn. He sold to the Bruntons at Crudie Acres Farm, Arbroath. The next best price of 11,000gn was paid twice. First at this price was the overall champion, selling to C & M Bruce, Tillyeve Udny. This was Drumacritten Ian, by Dermotstown Delboy, from the Nelsons at Drumacritten, Enniskellen, Northern Ireland. The other, selling to Backmuir, was the reserve junior champion from Islavale – Islavale Imperial, by Curaheen Giant. Other leading prices included 10,500gn for an entry from the Smith family’s Drumsleed herd at Drumsleed, Fordoun, Laurencekirk. Drumsleed Iceberg, by Islavale Ferrari, sold to Balbirnie Dairy Farm, Pitillock, Freuchie. At 10,000gn, selling to Pitgaveny Farms, near Elgin, was Scotland Hill Invader, by Glenturk Extra Special, from Thomas Hill, Wadworth, near Doncaster. Brechin breeder Heather Duff, of Pitmudie Farm, Menmuir, paid 8,500gn for the reserve intermediate champion. This was Hiltonstown Irish, by Dermotstown Delboy, from Richard Rodgers, Portglenone, Northern Ireland. Another at 8,500gn, selling to J & J Marshall, Daleigh, Advie, Moray, was Islavale Innis, by Atlow Dixon, from the Stronachs. Other top prices included 8,200gn for Team Icon, by Team Fabulous, from the MacGregors at Kirkton of Mailler, Craigend, Perth. He sold to A J Milne, Standingstones, Durris, near Banchory. Meanwhile, a top price of 7,500gn was paid in the dispersal sale of the Dyke family’s Mendick herd at West Linton. Leading the charge was the stock bull – three-year-old Blackford Grouse, by Hockenhull Waterloo – selling to the firm of S R Findlay, Neuk Farm, Cockburnspath, in the Borders. Mendick females topped at 5,200gn for eight-year-old cow Mendick Bridget, with her bull calf, selling to the McNees at Over Finlarg, Tealing, near Dundee.